From 24 March 2016, we’re changing the way headlamp aim is measured on the MOT test. The new testing standards will emphasise the importance of correct alignment and stress that it shouldn’t be just a quick check. It’s been trialled with the help of VTS council member volunteers with the results verified by the Vehicle Safety Research Centre at Loughborough University. The changes are similar to those introduced for Heavy Goods Vehicles (HGV) last year. Since being introduced in April 2015 the fail rate for HGVs have significantly decreased as a result. The new method is just a few simple changes and you don’t need new equipment. Headlamp aim consistently tops the MOT compliance survey as one of the most likely items to be assessed incorrectly by testers. These new changes will look to reduce errors and increase test consistency. So what are we changing? The changes will slightly widen the tolerance band for European ‘E’ beams with headlamp centres up to 850mm. We’re also changing the requirement to test the ‘image break’ point for all European 'E' beams. The method of checking the aim of the horizontal cut-off is the same. 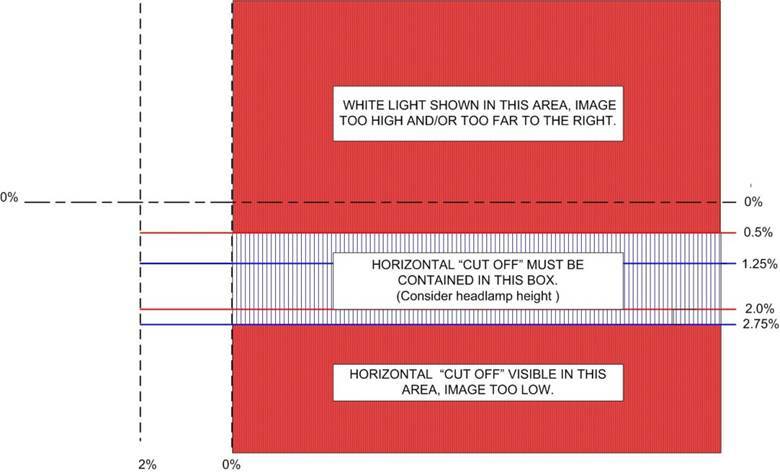 It’s only the lower limit for headlamps up to 850mm that has changed from 2.0% to 2.75%. In the past we've had to find the ‘image break point’ and check it’s within a very small area of the headlamp beam tester screen. If the ‘break point’ was outside of this small box then the headlamp would fail the test. You won’t need to check that anymore. 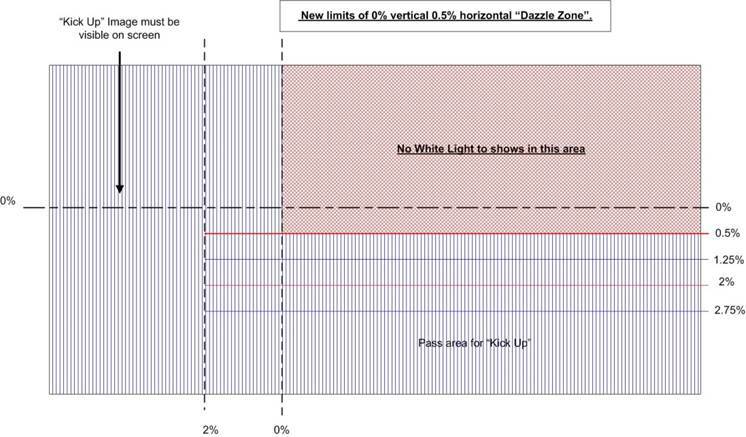 From 24 March 2016, you need to check for “white light” in the area formed by the 0% vertical and the 0.5% horizontal lines for all European 'E' beams. We've called this the 'dazzle zone' because if a beam is aimed in this area then it’s likely to dazzle oncoming vehicles. Any white light in this area would result in the headlamp failing the test. Finally, you must still make sure that there is a 'kick up' visible on the screen if it’s required. Remember that not all headlamps have kick ups, some have flat tops and some have beam deflectors fitted. 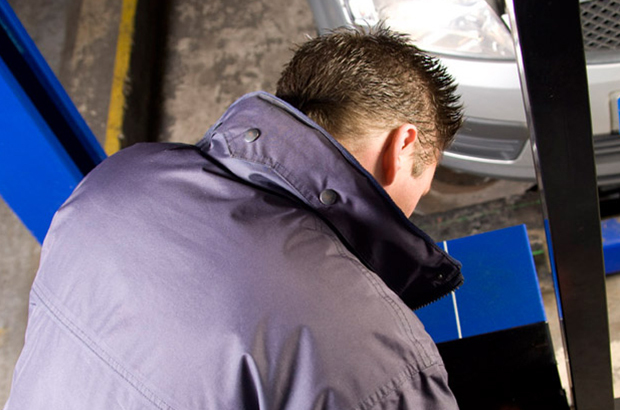 The MOT inspection manuals on GOV.UK have been updated on 24 March 2016 to include the new standard. You can take a look at the new headlamp aim inspection manual pages for classes 1 and 2 and for classes 3, 4, 5 and 7. If you have any questions about the new standards please email testing.technical.standards@vosa.gov.uk. Can anyone answer this. Can a council test taxis to mot stands without any Nt doing them. Obviously it's a taxi exempt cert so not done on the mot site. Or In fact if the person doing them is not a qualified mechanic in any way. To make more people get it right lets make the standards slacker. Does this mean you can no longer mask a left hand drive headlight to remove the kick up? Why can't the company with the orange sign and black lettering, be forced to stop fitting car bulbs. Once again they charged this customer a small fortune and fitted both head lamp bulbs incorrectly, both stop and tail bulbs incorrectly. For gods sake, fitting a bulb is easy. Why can't they just leave it to us professionals. At we check head light alignment afterwards. The only reason the fail rate has been so high over the last 10 years is because we've been P R S'ing . The fact is that a lot of headlamps are out of adjustment. Car manufacturers always set them to low at the factory, so if on PDI they're not checked, then first MOT they fail. Then there is some other problem, maybe it,s because they put 55psi in the tyres, but most new car PDI's that I do, I have to set the headlights. Was doing it 10 years ago, doing it again now!!! 472 bulbs=longer lasting,better locating lugs and a better light souce ..the old wattage limit and diffused lenses were best .im all for good brighter lights if they level all roads, speed humps and bridges. .when driving in front of a vehicle with "search lights" try switching your dipped headlamps of for a couple of seconds, if safe to do so.. This is what is called "job creation". Generally job creation just makes life more needlessly difficult for the people who actually do something useful. Mechanical failure or poor adjustment, even historically, relatively rarely causes serious accident. Address the real problems. it says that a kick up must b visible on the screen, does this mean that if the headlamps are presented with tape on them covering up a kick up to the right its now a fail or even if its has 'beam benders' fitted. this is typical on how the test is going always dumbing down the test its scary and its only going to get worse. Going back to a slightly earlier post with "dealerships" partly being at fault by not adjusting lights. I have to disagree. I work for a suzuki dealership, and i spend most of my days adjusting cars headlamps on their first test. Been doing it for donkeys years, and will probably carry on doing the same for years to come yet. The problem for me lies at the factory where the cars are made. Quality control not being what you might expect, but that aside, the new "limits" are quite easy to understand and NOT that different to the old limits. Very true, certain shops that offer fitting of bulb, don't do it right and u end up having a circular very dazzling headlamp beam almost like a main beam. I have hade possibly hundreds and hundreds of repositioning of the headlamp bulbs to correct the mistake of the shop keeper. This problem always fails MOTs. Are you surprised , many cars require a near disassembly of the front end to get new bulbs in !! This is a retrograde step, headlamps should be adjusted correctly, for both driver and pedestrian safety (being able to see them) I don't understand why after all these years headlamp alignment is less important. Like the graphics, good idea but PLEASE slow it down. I think is ok, we will all get use to it. I fail to see how the existing test is in any way difficult to work to. The only minor annoyance is headlamps where the beam image is a bit hazy and lacking in definition. It just seems bizarre to me that you can now have a headlamp pointing way to far to the nearside and it will pass the test, while giving a great lighting up of the hedgerow and not the road. So for me, this new test procedure is a FAIL! And don't forget Mark, this company that sell s bikes charge for fitting bulbs in wrong. My company don't charge for fitting but do charge for the bulbs. please make the video slower. to watch. Seems a very minor thing to be concerned with on an MOT when there are much bigger problems with the outdated test. Biggest problem I see with testing now is how much of the test you simply can't do any more because of plastic covers. Undertrays and engine covers are virtually covering everything on some cars now. It's ok to mention it as an advisory to cover yourself but I, personally would rather be able to check it as I am responsible for deeming a car safe to drive. Everyone seems to hate the idea of 4-4-2 but if a car is going to be checked properly then it has to be better surely. Well done Ronnie you 'hit the nail on the head', this exactly what it is all about, the DVSA obviously want 4-2-2 as they are enforcement and this will benefit them, this is to reduce failure rates so that statiticians can say cars are safer! I know what you mean. We bought a new pick-up in 1981 and I took it to Largs to visit my Grandma the 1st weekend we had it to put some miles on. Returning as the light failed I put the lights on to find nothing! New car delivery, the biggest rip-off going! It is very difficult to study the fail diagram and the pass diagram because the animation changes too quickly. how we can pause the moving images? I'm finding most of the time when I'm testing headlights & failing them, are from incorrectly fitted bulbs , either fitted by the customer or dare I say it some of the large motorist stores that charge for fitting they bulbs they sell & not fitting them correctly. Vehicle manufacturers should also be looking at ways to make it easier for a bulb to be replaced & fitted correctly , not have hands the size of a small child to be able to access the bulb holder or strip half the front of the car off to gain access to the bulb. I'm liking the new moving graphics for the special notice to show what's what, more of this would be handy for other areas of the test or perhaps incorporated into the online manual, but any chance the speed of the graphics can be slowed down somewhat or the user could control the speed, pause, etc. Nothing wrong with the old system. They are just making it simpler, either to make it easier for our ever increasingly daft youth becoming testers, or to reduce fail rates (why, g*d knows). If you every get chance, watch the movie 'Idiocracy'. It's a fairly true representation of what we've got to look forward to in the future. I saw this film last year and sadly images of keep coming back , I fear it will all come true. And personally this new headlamp aim image does make more since ??? you can adjust a customers light year upon year having set them perfectly the previous year. has anyone taken into account the state of British roads or the amount of so called traffic calming humps that cars have to deal with!? Take away the human element(ie Tester ) and nod nod "its a friend" the MOT test would be worth the paper its printed on.